Before we decided that Tucson was to be our home, we dreamed of moving to Lucca, in the Tyrrhenian plains of Tuscany, Italy. We absolutely love Lucca - its rich and vibrant history, the architecture which runs from medieval to Art Nouveau, its cultural scene, its people, its few tourists, and, of course, its food. For Mark's 50th birthday (you may recall that he just turned 60) we decided to spend a week in an apartment in Lucca. We rented an apartment, adjacent to the Duomo di San Martino, the city's cathedral. When we travel, we enjoy spending at least a week in a single place so that we can get to know the neighbors, shopkeepers, restaurant staff, and market vendors. No matter how we respect local custom, we know we are identifiable as tourists, but that is also the reason people remember us when they encounter us more than once. They are honored when mere transients choose to patronize their business more than once, especially small places off the beaten track. In Lucca, we made friends easily. One couple that stands out is Stefano and Silvia. Stefano runs a small ceramics shop called Vissidarte at Via Calderia, 20. Stefano loves opera in general, and Puccini, in particular. Every Luccan loves their native son, Giacomo Puccini, but Stefano makes it an art form. Literally. He has named his shop after one of the most famous Puccini arias - Vissi d'arte (“I lived for art”). He and I had a great time discussing opera and music, and he is quite knowledgeable. We bantered half in English and half in Italian, and he recommended that Mark and I tour Puccini’s house a block away (which we did) and, of course, we bought ceramics from Stefano. You can't turn too far in our home without seeing something from his shop. Our cabinet knobs, our olive oil dishes, our soap dish, our olive oil bottle, our cookie jar...the list goes on. Once we even had friends buy us additional knobs for our kitchen in Maine. Naturally, we brought all the knobs to Tucson with us! One afternoon that April in 2002, we came across a line at a bakery. Wouldn't YOU want to know what invited this line? It was for the Luccan specialty - torta di erbe. 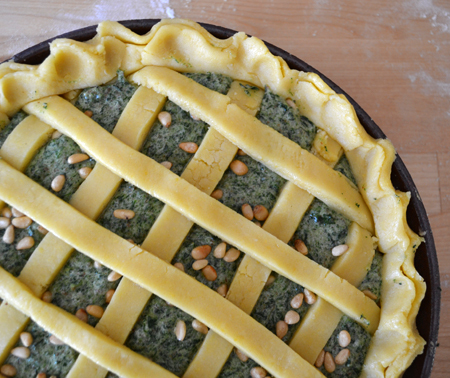 It is a savory-sweet pie made with spinach and spices. The memory of the moment was heightened by the passage through the narrow stone streets of three contadini playing traditional shepherd’s instruments. A couple of years ago, I made a torta di erbe for Mark's birthday. Recently, on National Public Radio, Mark heard a story about a similar pie that is an Easter specialty of the Province of Lucca. He forwarded the link and I made it from the recipe online. It is NOT what we had in Lucca – perhaps I’ll share a recipe for that one another time – but it was really unique and very good. How good? Well, at Easter dinner one very particular (read: picky) teen took a piece and really liked it. The ingredient that gives this dessert its unique flavor is maraschino liqueur. I bought a bottle just for this recipe. At first I assumed, for cost-saving purposes, I could simply buy a jar of maraschino cherries and used the juice. Upon opening the bottle of liqueur, I can say that drained cherry juice would have been a big mistake. 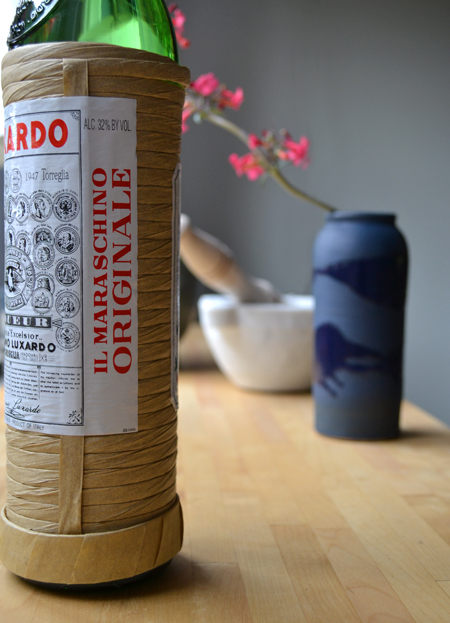 Maraschino liqueur has no resemblance to the lurid plasticized cherries that share the name. It is like no other liqueur I have ever had. It is herbal with a slight almond overtone, and has an aftertaste similar to Drambuie. It is made with cherry pits, as amaretto is made with apricot pits. It really has no cherry taste at all. Though auto-correct confuses Tucson with Tuscan, Tucson isn't Lucca and, conversely, Lucca isn't Tucson. I am truly glad we made the choice we did, as we can always visit our beloved Lucca, our friends there, and, of course, the bakery where we first had Torta di Erbe. 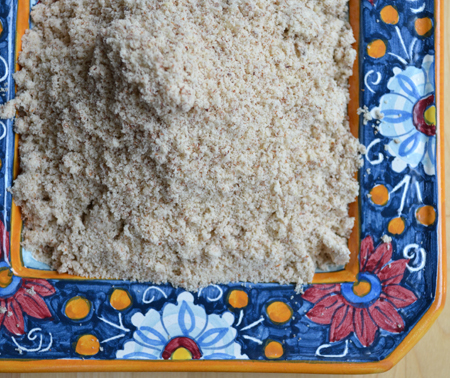 Mix the flour, butter and sugar in a food processor fitted with a steel blade until the mixture resembles coarse sand. Mix the egg yolks with the ice water and add that mixture plus the baking powder, zest and salt; mix until dough forms. Roll the dough into a disc, cover with plastic wrap and refrigerate for at least 30 minutes before rolling out. Lightly butter a 10-inch deep-dish pie pan. Roll out 2/3 of the dough, making it large enough to hang well over the sides. Using a fork, poke holes throughout the entire bottom and sides of the crust. Refrigerate. 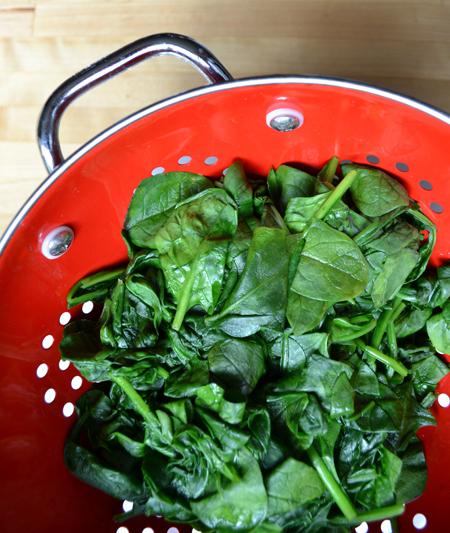 Cook the spinach in a few ounces of salted water until tender. Allow to cool. Squeeze out all the cooking liquids and finely chop in a mini food processor. 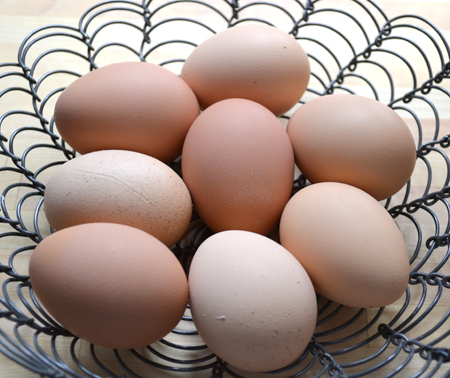 In a bowl, beat the yolks with 1/3 cup of the sugar until creamy and light yellow. Add the ground almonds and beat until well combined. Add the spinach, candied peel and liqueur, and mix until well combined. 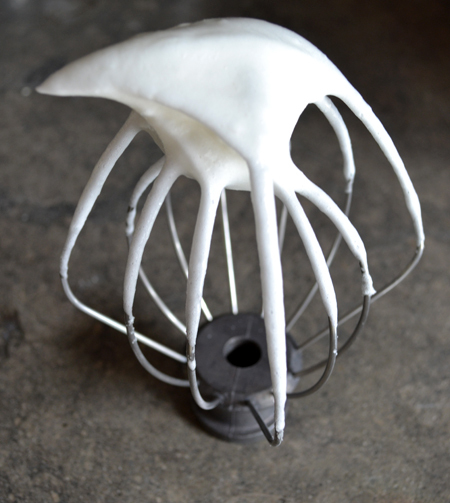 In a separate bowl, beat the whites until soft peaks form, then add in the remaining 1/3 cup of sugar and beat until it forms a glossy meringue. Slowly fold the meringue into the yolk mixture. Pour into the prepared crust. 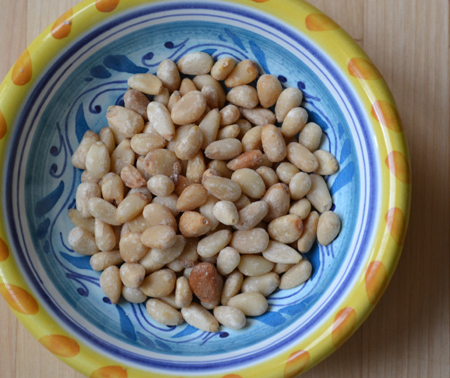 Sprinkle with the pine nuts. 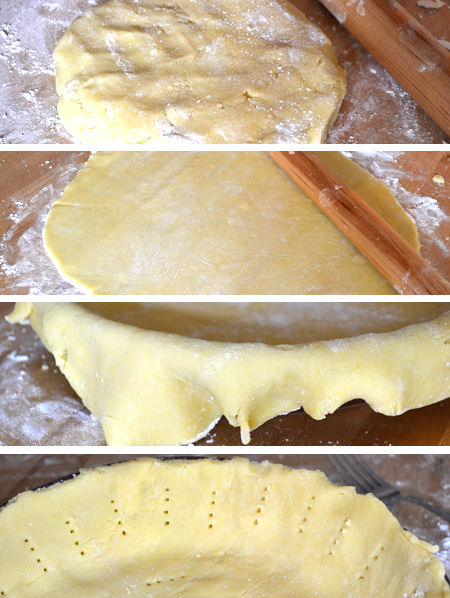 Roll out the remaining dough to form a lattice over the top of the filling. Bake for about 1 hour, until golden. Allow to cool to room temperature. Serve sprinkled with confectioners' sugar. 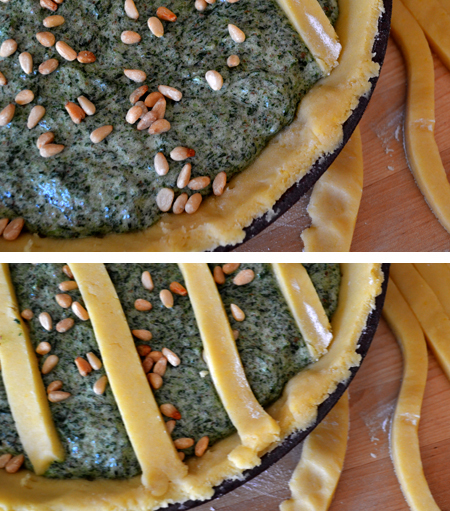 Having grown up with torta pascualina, which is an italian easter savory spinach pie with whole egg inside, this sweet recipe blew my mind! It´s the kind of thing I want to try right now. So so so interesting. And I never had the liqueur, but let me tell you David, marraschino cherries are one of my loathed ingredients, starting with the color. Like those cheap cut up candied fruits in bright colors. Such great info about the original liqueur. I will search for it and make this! Did you know that to achieve that bright red color in commercial marraschino cherries, first they completely take out the color, leave them almost white, and then dye them? Because cherries have a not very nice brownish color when preserved in their natural state. Paula - neither of us like those horrid "cherries" either! But the liqueur? Amazing! 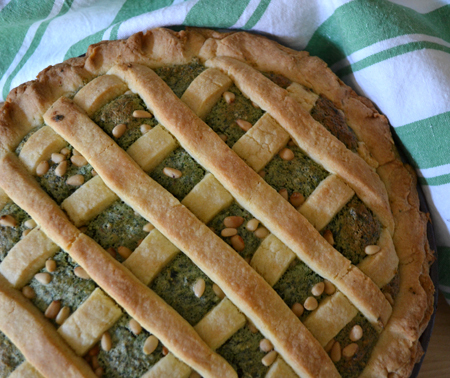 I love the torta di erbe and other savory spinach pies - but this one is really different. 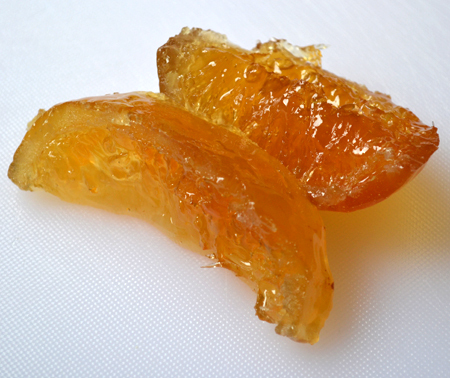 And really good citron (as opposed to the unnatural colored fruits in fruitcake) really makes a difference. as always, your photos are exquisite! It is funny, but sometimes when it says "anonymous," I actually think I know who it is! Glad you love the photos! I hope you try out the tart! This is such an interesting recipe David! I recently saw a french recipe for a sweet chard pie, and not being fond of chard thought, Feh! 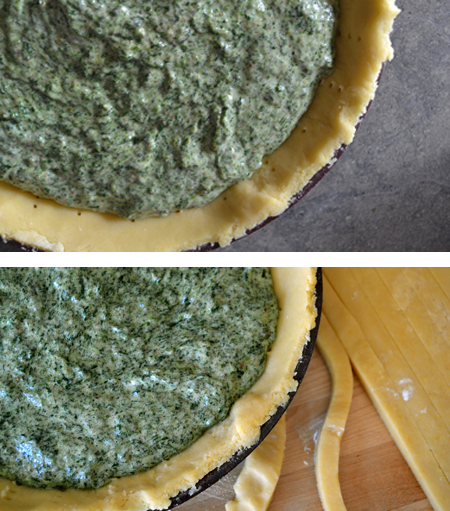 Why ruin good pie....but now spinach, (and pinenut), well Hell YES! Thanks, Karin! Maybe we will be seeing this or Torta di Erbe in an Oregon bakery soon! The timing of this post is perfect, David! We arrive in Lucca in ten days. I only wish we were going to be spending a week there like you did. I shouldn't be greedy though - a small taste is better than no taste at all. Will definitely try this recipe. Thanks so much!!! Oh, Kirsten! Have a wonderful time! If you need any restaurant recommendations, Buca di Sant'Antonio was exquisite, and Trattoria da Leo is a institution there. Their zuppa di farro is my favorite ever! And if you see Torta di Erbe in a bakery, have a bite for us! This is such an interesting pie, it sounds amazing. Sending it to my Italian best friend to see if she or her mom can make it for us :) Also, funny how Tuscon and Tuscany are so close in sound :) Maybe it is fated that you live in both! David, you bring Italy alive in your kitchen! This one is just gorgeous. Reminds me a li'l bit of a Persian herb frittata called kookoo. Maraschino cherries. Toxic in colour. Toxic in flavour. For as long as I can remember I picked them out or off things and disposed of them. David, I love this post. 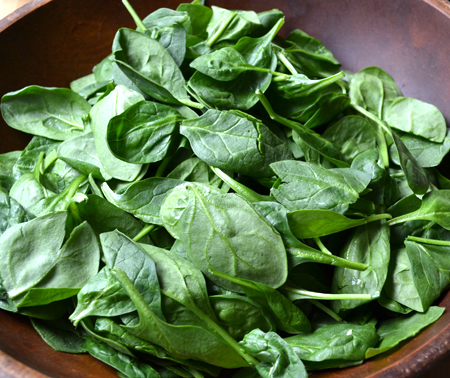 From learning about your treasures from Italy to a spinach pie that's loaded with sugar. I'm trying to get my virtual tastebuds around the savoury sweetness. I think I need to try this! Thank you so much, Colette! I will have to check out kookoo! Ahu - have you heard of this? John - I wonder why people think that chocolate coating them makes them any better. This pie is definitely worth a try - so unique! This is such an interesting recipe, and lovely photos as always. I've had sweet feta cheese pie in Greece before, and savoury spinach pie, but never this. We've got a vegetarian friend coming to stay for a couple of nights in May, so I might have to give it a shot! You make Italy sound just wonderful - any plans to visit again soon? Italy IS wonderful - and we are headed to Venice for the first two weeks in October. It will be my first time in the city. I hope your vegetarian friend likes the pie - it is rather sweet, although I imagine leaving out the sugar might make it palatable for a main course. Oh lucky! The only time I went to Venice I was about 4 or 5, so the only thing I remember about it is the ice cream! You'll have a wonderful time, I'm sure. Oh David, your ideas are always so interesting and inviting AND informative. As you know, we have been to Lucca but, unfortunately, it was before we knew you and all your secret places. Thanks again for such an enjoyable read! It was fun to use the citron glacée two weeks in a row! Maybe you need to try Kucca again, Susan!